Kirsty Gilmour and Kieran Merrilees retained their singles titles at the Yonex Scottish National Championships at Bell's Sports Centre in Perth. Hamilton's Gilmour made it four wins in a row and Merrilees, from Glasgow, also claimed his fourth title. 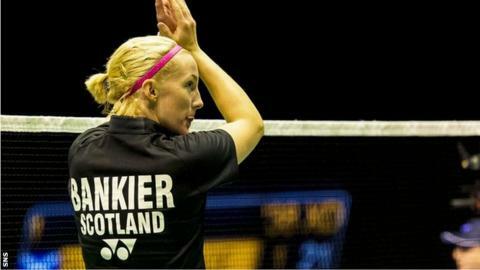 However, they were both upstaged by the 2011 world silver medallist, Glasgow's Imogen Bankier. She took her Nationals title haul to 15 with a sixth women's doubles title and a ninth consecutive mixed doubles win. The one upset came in the men's doubles with Edinburgh's Martin Campbell and Glasgow's Patrick MacHugh winning the title for the first time. In the women's singles Gilmour, the Commonwealth Games silver medallist, defeated Mauchline's Holly Newall 21-7 21-3 in a repeat of last year's final, having beaten Prestwick's Ciara Torrance in the morning semi-finals 21-11 21-8. Merrilees had to survive a stern semi-final challenge from Torrance's brother Ben in a 65-minute men's singles semi-final before winning 20-22 21-17 21-18. He then needed to dig in against a determined Matthew Carder before repeating last year's final win over his Edinburgh rival 21-16 10-21 21-11 in 52 minutes. Carder, the other 3/4 seed, had beaten Glasgow's Gordon Thomson in their 50-minute semi-final 21-14 10-21 21-14 as the closing stages of this event was keenly contested. Gilmour also claimed her third women's doubles title when she and Glasgow's Bankier defeated second seeds Rebekka Findlay (Erskine) and Caitlin Pringle (Glasgow) 21-6 21-14. Bankier added the mixed doubles crown when she and Robert Blair overcame 18-year-old Adam Hall from Mauchline and Edinburgh 17-year-old Julie MacPherson. The Commonwealth bronze medallists and two-time Scottish Open Grand Prix winners retained their title with a 21-10 21-13 win. Finals day would have seen all defending champions retain their titles but for the defeat of two-time winner and former world silver medallist Blair and his 2013 partner Thomson. The top seeds lost to second seeds Campbell and MacHugh 21-18 21-18. Scotland's top-ranked doubles pair, who were runners-up to Blair and Paul Van Rietvelde last year, lifted the men's doubles trophy for the first time but before beating Blair and Thomson they also needed to come through a tough semi-final against Hall and Alex Dunn 23-21 22-24 21-5.